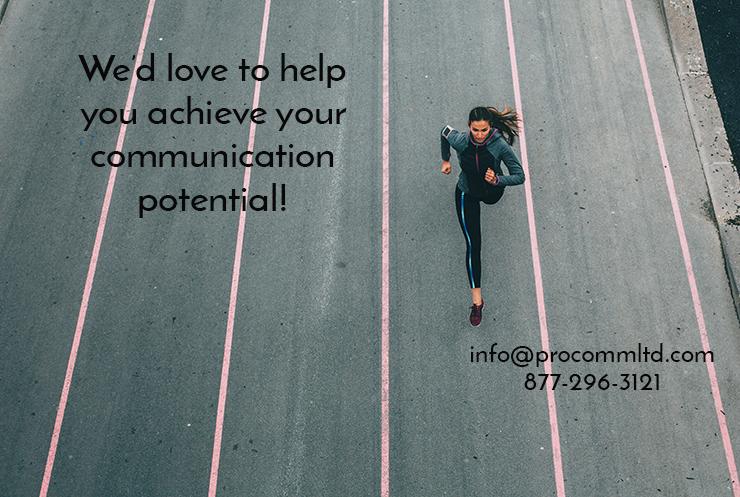 Private Consultations - ProComm Ltd.
As a business professional, you know the importance of preparation for any communication situation. But, because of your busy schedule, preparation time may be limited. Communicating with confidence is a leadership skill. Being able to motivate, persuade or inspire others to action is what business is all about. Whether you have an upcoming high-stakes presentation, need to communicate a strategic initiative throughout your company, or be effective in one-on-ones with your associates, Private Coaching is designed to meet your specific needs. Focus areas include content development and organization, handling challenging questions and working on your delivery skills using video feedback. The half-day or one-day consultation is tailored to your specific needs. One of our executive consultants will meet with you to work on a specific communication situation integrating your personal style in the areas of Content Organization, Delivery Skill Enhancement and Effective Interaction with your listeners. The consultation can be xheld at your offices or it can be taken off-site in order to eliminate distractions. One-day or half-day sessions are offered.